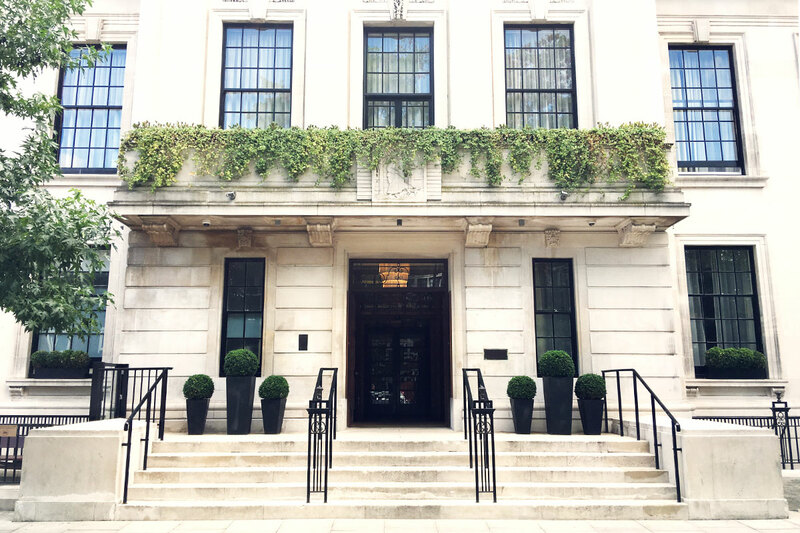 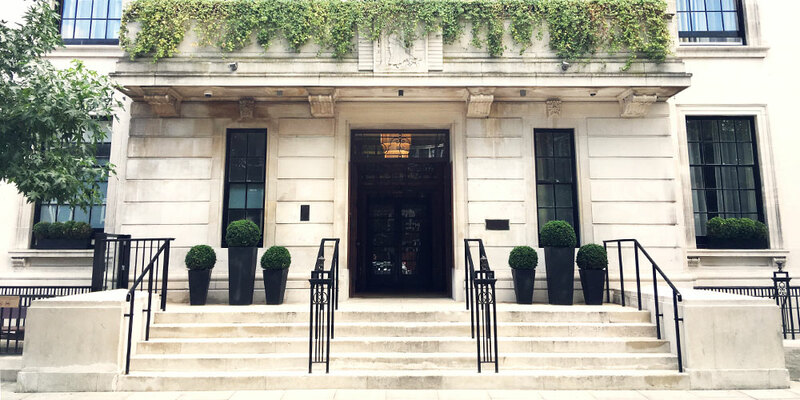 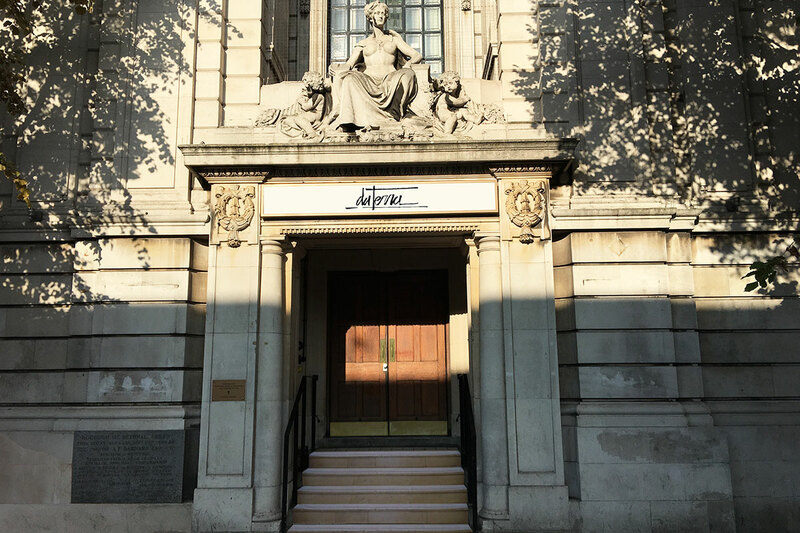 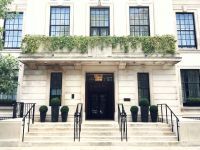 Situated on the ground floor of the award winning Town Hall Hotel in London’s vibrant East End is Da Terra Restaurant and Bar. 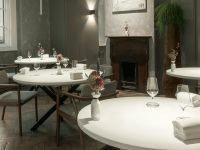 This is the first venture by Brazilian born chef, Rafael Cagali who worked alongside Heston Blumenthal at The Fat Duck, three Michelin star chef Quique Dacosta, Martín Berasategui and he headed Simon Rogan’s Aulis. 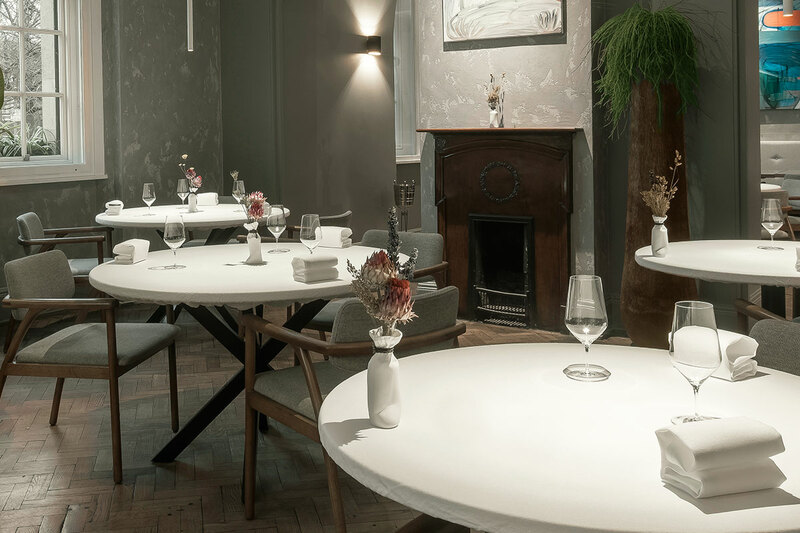 Da Terra will serve a tasting menu consisting of 9 courses which will showcase Cagali’s skills and knowledge collected through his culinary journey in some of the finest restaurants of Brazil, Italy, Spain and England. 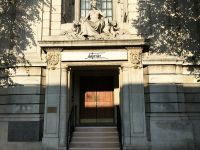 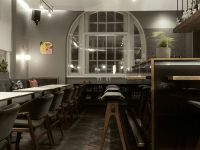 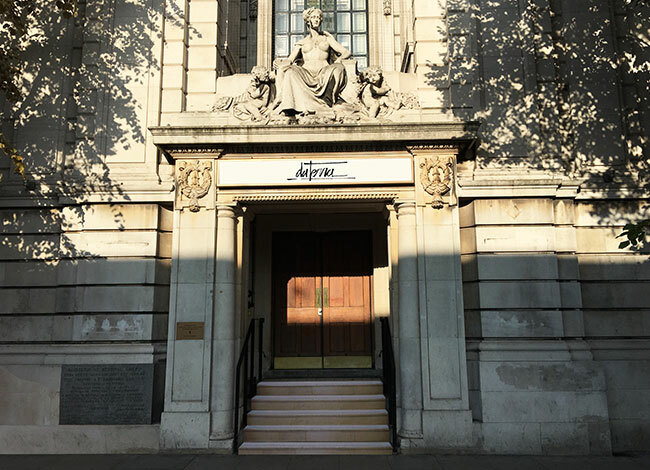 Chef Rafael Cagali and Paulo Airaudo of San Sebastian's Amelia restaurant approached Blenheim Design to undertake the refurbishment of the Town Hall Hotel’s restaurant and bar. 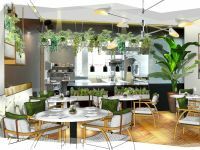 Da Terra Restaurant and bar designers have enhanced the hotels sophisticated interior with elegant and hip furnishings suitable for this cool part of London and discerning locals. 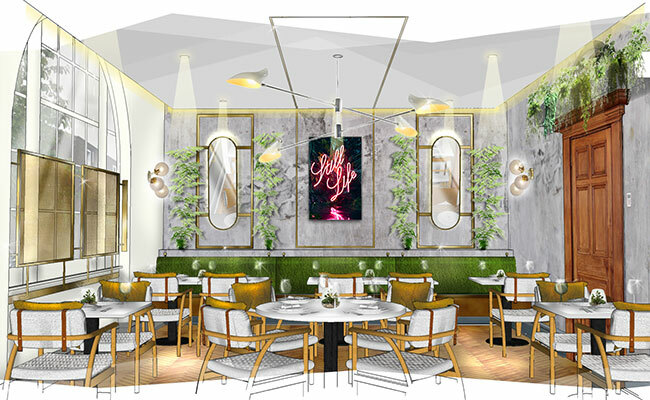 Restaurant design brief was to encapsulate the roots and provenance of Cagali’s and Airaudo's lives into the interior of the restaurant and bar; creating a refined dining destination. 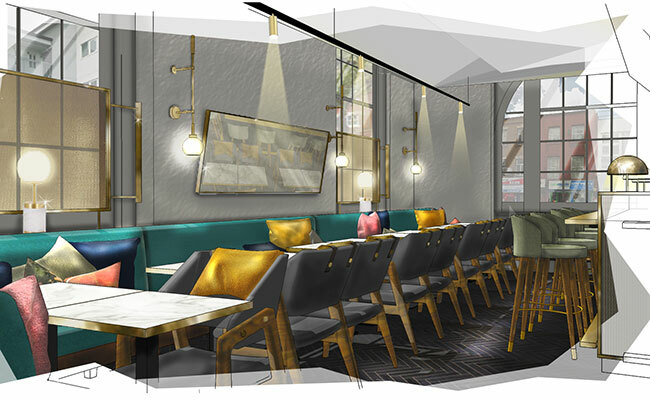 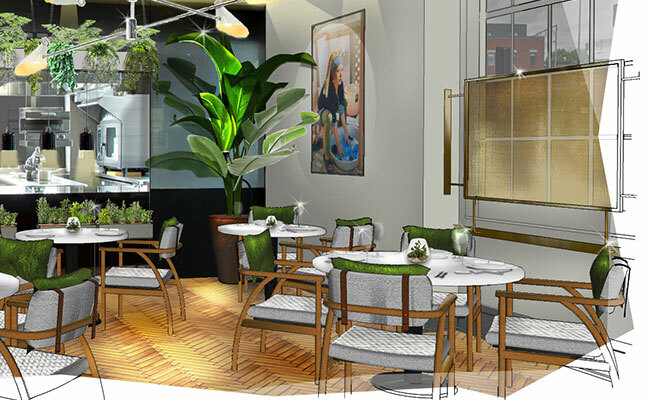 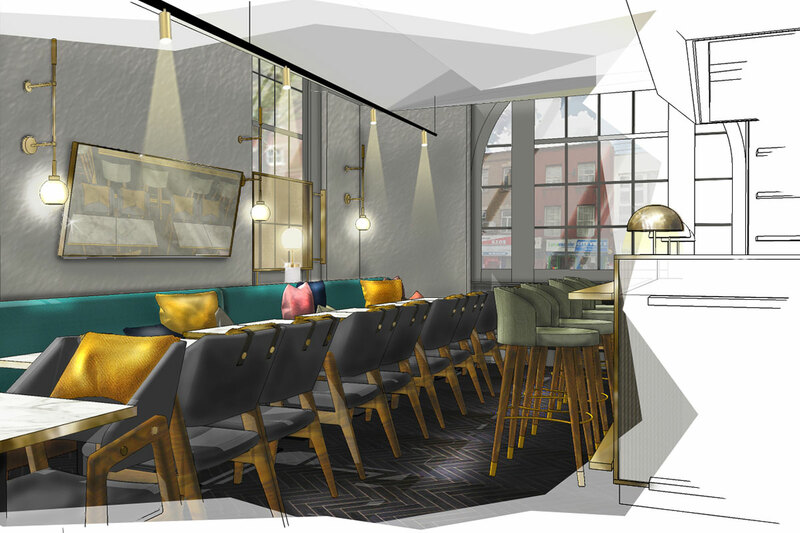 Diners at Da Terra will sit amongst original Edwardian features, encapsulating the grandeur we wanted to preserve, and we’ve introduced just the right amount of industrial finishes to create a unique splice of old and new. 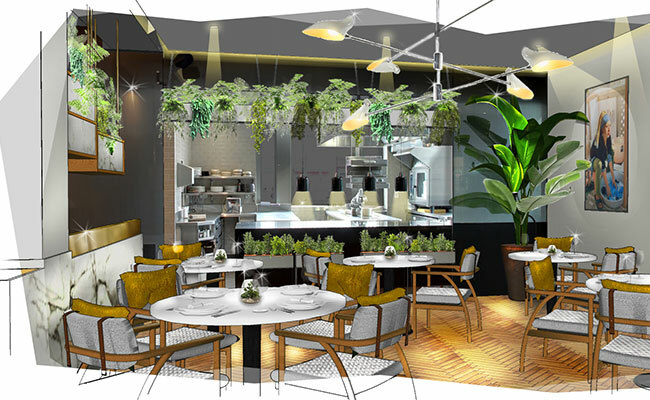 Chef Rafael Cagali will be plating up his seasonal menu in an open kitchen, and his love of food and provenance of the dishes can be enjoyed by hotel guests and discerning locals. 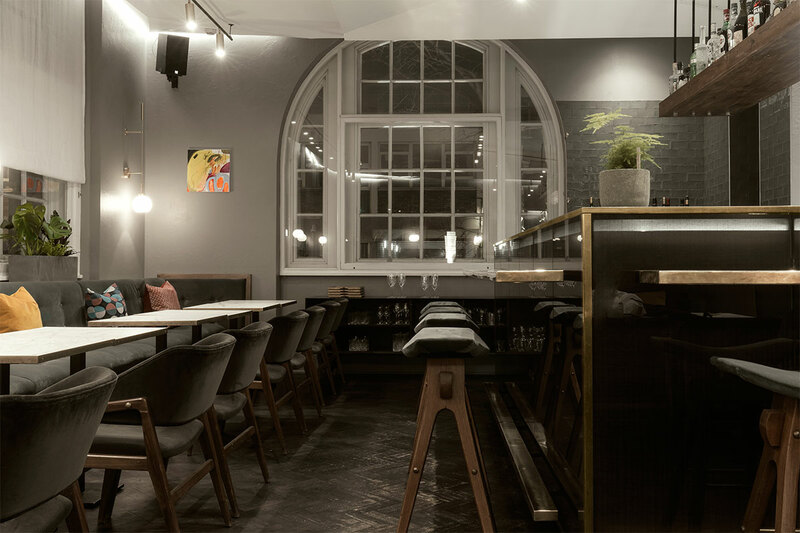 The gorgeous original parquet floor, stylish upholstered wooden furniture and period fireplaces contrast against new wall finishes and the grand original arched windows are to be dressed with bespoke framed screens of woven brass mesh. The prominent feature is the granite fronted open kitchen, where the dishes are expertly plated, injecting a true sense of culinary theatre into the dining experience. 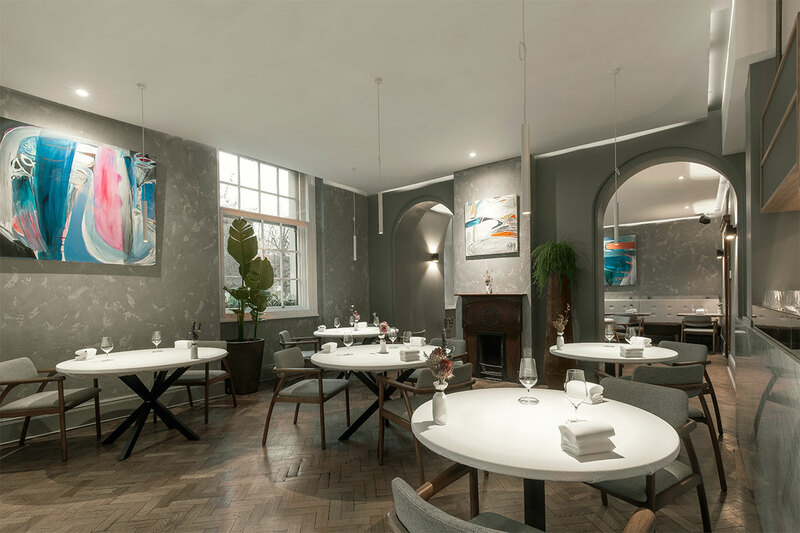 Our design team have carefully merged modern finishes such as exposed concrete walls, long pill shaped mirrors, aged brass screens and Carrara marble into the rooms which complement the heritage and the period features. 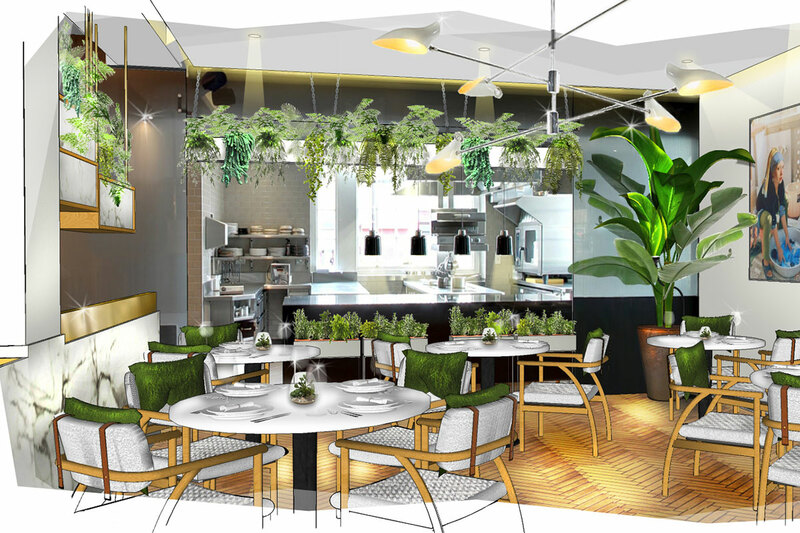 Large tropical pot plants bring a touch of Cagali’s life to the restaurant as does the rotating Brazilian wall art which will be available for purchase. 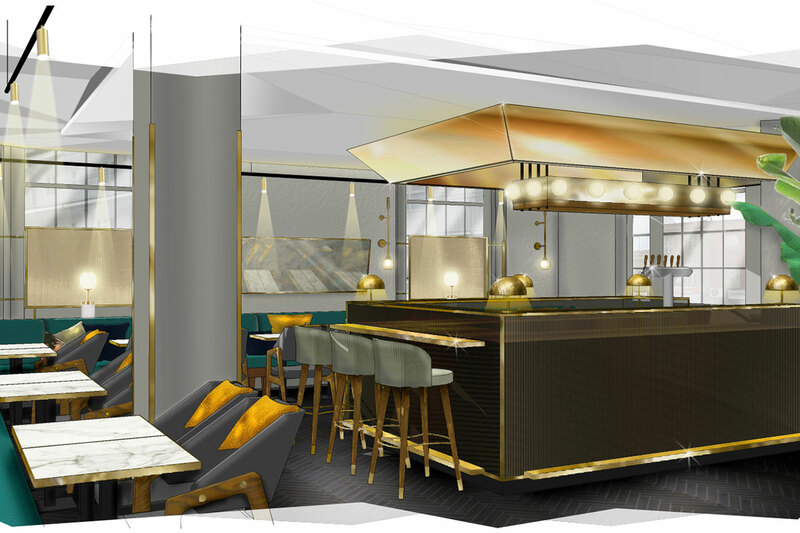 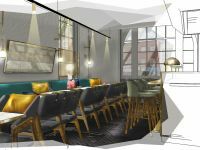 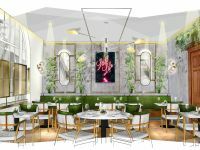 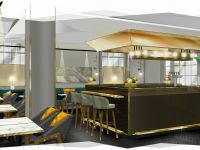 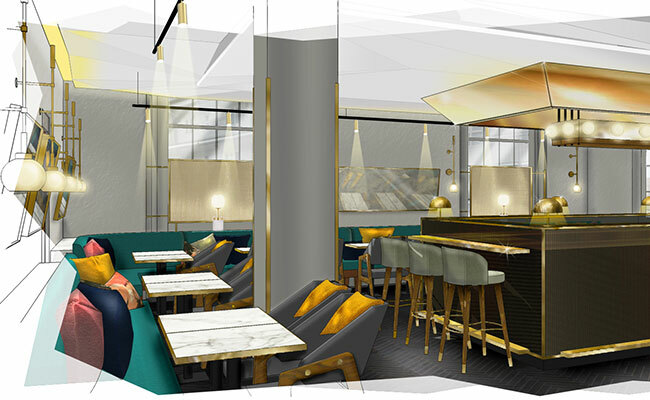 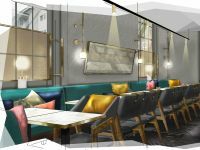 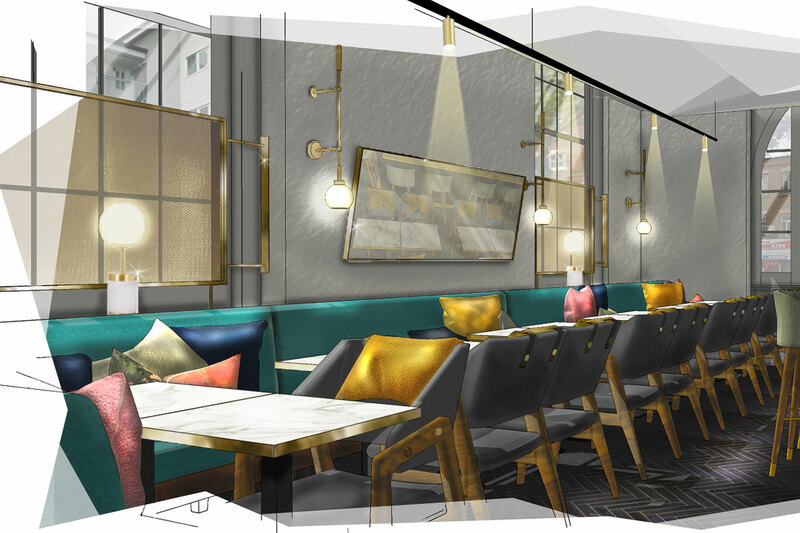 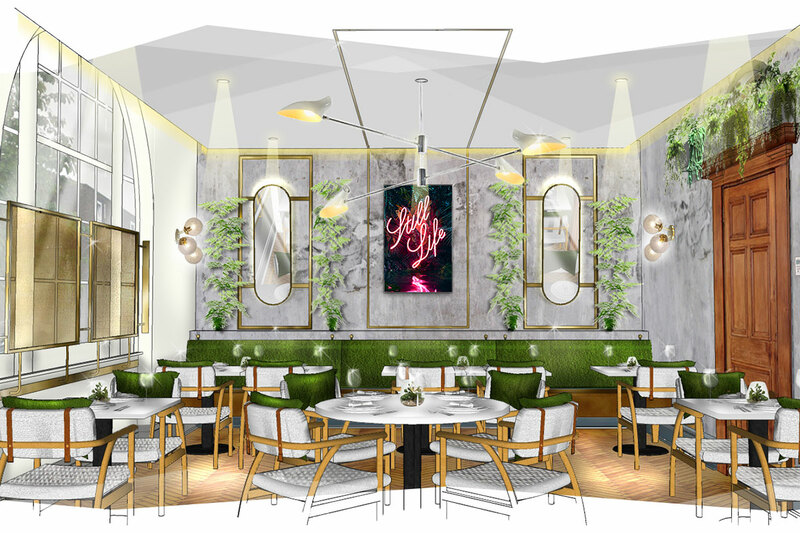 The dining and bar experience will be beautifully illuminated and bespoke wall lights designed by yours truly Blenheim Design will feature in this exciting new venture for Chef Rafael Cagali.